2014 Australian Open: It’s 110 degrees at the Australian Open. Why don’t tennis’ best players refuse to take the court? It’s 110 degrees at the Australian Open. Why don’t tennis’s best players refuse to take the court? 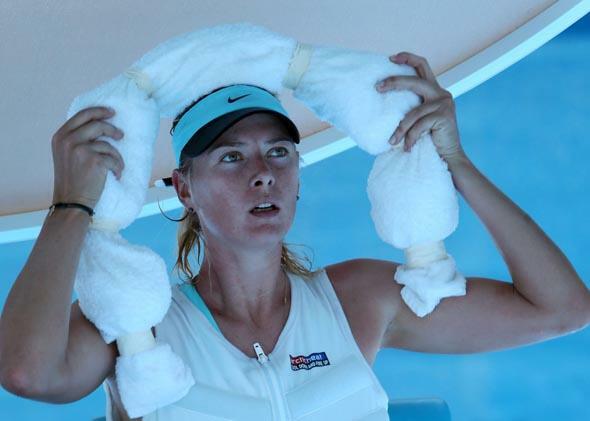 Maria Sharapova tries to cool off during a break at the Australian Open on Thursday. Based on reports emerging from the Australian Open, the conditions at tennis’s first major of 2014 are akin to playing inside a toaster on the surface of the sun with a hairdryer in your face and an active volcano burbling beneath your feet. The temperature rose to 110 in Melbourne on Thursday, at which point play was finally halted. In the days before, when the thermometer read a mere 108, a succession of players fainted, vomited, and retired from their matches on account of the blistering heat. Caroline Wozniacki’s water bottle melted, as did the soles of Jo-Wilfried Tsonga’s shoes. And yet, the Australian Open didn’t pull players off the court until the tournament’s fourth day. Even then, the tournament’s “Extreme Heat Policy” mandated that they finish their current set before getting a reprieve. As Sports Illustrated’s Jon Wertheim noted, the tournament doctor explained that “tennis, as a sport, is relatively low risk for major heat problems compared to … continuous running events. … [T]hat’s why by and large, like cricket, we can play in these conditions and not be too concerned.” Though I have not seen video of these remarks, I’m imagining the doctor watching a five-set match on television while being fanned by palm fronds and sipping an iced tea. Why are the players putting up with this brain-boiling insanity? The tournament lasts two weeks, and it could surely finish on time even if play gets halted on occasion to stave off spontaneous athletic combustion. Back in 2011, Andy Roddick and other players made some noise about unionization after being forced to play in slick conditions during the U.S. Open. (That year, rain delays ended up pushing the men’s final back a day for the fourth consecutive year. It happened a fifth time in 2012 before organizers capitulated and scheduled the final for Monday from the beginning.) Roddick also expressed annoyance about the length of the season, an 11-month grind that gives players little time to recover from injuries. Given the callousness of Australian Open officials—“we can play in these conditions and not be too concerned”—it’s inarguable that the players need to look out for their own best interests. It’s also clear, based both on the history of other sports and of tennis itself, that collective action gets results. As Sports Agent Blog’s Chris Lesley pointed out, threats of a player boycott over prize money in 2012 led the Australian Open to increase its outlay of prize money by 15 percent. So what’s holding back unionization? Extreme income inequality, for one. While Major League Baseball, the NBA, and the NFL all have minimum salaries—thanks, players unions!—tennis players at the bottom rungs struggle to break even due to the high costs of travel and coaching. A struggling up-and-comer like Colin Fleming, then, has about as much in common with me as he does with Novak Djokovic. At the sport’s highest level, too, there’s no universal agreement about thorny subjects like drug testing, scheduling, and the ranking system. Rafael Nadal and Roger Federer, normally the best of pals, had a bit of a falling out a few years ago over Nadal’s belief that Federer wasn’t speaking out about the issues bedeviling tour players. Given the realities of life on tour, perhaps it’s unrealistic to expect the players to practice all day and organize at night. Maybe it will take someone like Marvin Miller, who came from United Steelworkers to lead the MLB Players Association, to convince the world’s servers and volleyers that they’re stronger together than they are apart. Hopefully that will happen before any more players pass out, or someone really does die out there.